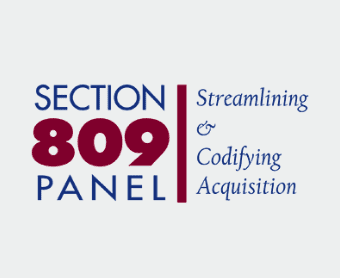 THE SECTION 809 PANEL’S VOLUME 1 REPORT is the first of three volumes and continues the panel’s mandate for making recommendations to streamline acquisition. To date, the efforts of the panel have proven highly productive, and outreach efforts continue to generate hundreds of ideas for improving acquisition that the panel is diligently investigating. The May 2017 Section 809 Panel Interim Report provided three statutory recommendations that were all enacted into law in the FY 2018 NDAA. Through these actions, Congress demonstrated its willingness to expedite the panel’s recommendations to improve the efficiency and effectiveness of the DoD acquisition process. In the coming months, the panel will continue to be a partner to Congress, DoD, and industry in support of further efforts to streamline acquisition to better enable DoD to meet its strategic warfighting goals. One key area of work for the Section 809 Panel is the conceptualizing of a Dynamic Marketplace framework—an outcome-based acquisition process for providing DoD simplified access to the global marketplace. The panel’s research shows that the current acquisition process is an obstacle to DoD’s ability to access a marketplace that has moved far beyond the traditional defense industrial base of the Cold War era. Accordingly, the Section 809 Panel has started to develop a new framework that can harness the benefits from the global marketplace of ideas, solutions, products, and services at a speed that is closer to real-time than the current acquisition process allows (see the Volume 1 Report for details). The Volume 1 Report contains recommendations to update the process by which DoD acquires IT business systems, to streamline DoD’s cumbersome auditing requirements, to address challenges in how the small business community and DoD interact, to update commercial buying, to clarify the definition of personal and nonpersonal services, to remove statutory requirements for 13 acquisition-related DoD offices, and to repeal 20 acquisition-related statutory reporting requirements. In all cases, the Section 809 Panel has laid out the rationale for change, and followed up with specific, actionable, statutory and regulatory language. With the advent of Uniform Grant Guidance, everything from the way you apply for grants to how you manage your funding has changed. It’s imperative that your entire team is not only up-to-date on the latest grants rules and regulations, but also that each person knows the steps to take to protect your funding. Join us at the Federal Grants Forum in Seattle, WA, on April 30th through May 2nd to learn from powerhouse sessions delivered by knowledgeable compliance experts in the grants, accounting and legal communities while networking with other grants and finance professionals facing similar challenges. You’ll walk away with clear guidance about the new requirements under 2 CFR 200, how the changes will impact your federal programs and where to start. • BONUS! A print copy of the Uniform Guidance – a $49 value! • BONUS! Thompson’s Grants Quick Start Toolkit to help you through the entire grants lifecycle – a $249 value! Join us at the Federal Grants Forum in Orlando, FL, on February 25th through 27th to learn from powerhouse sessions delivered by knowledgeable compliance experts in the grants, accounting and legal communities while networking with other grants and finance professionals facing similar challenges. You’ll walk away with clear guidance about the new requirements under 2 CFR 200, how the changes will impact your federal programs and where to start. This in-depth course is geared towards experienced procurement practitioners and will also expose less seasoned professionals to the most challenging issues faced in a CPSR. The purpose of this course is to explore the more complex, high-risk and challenging compliance areas the contractor community encounters in Defense Contract Management Agency Contractor Purchasing System Reviews (CPSR). The objective of this course it to provide the attendee with compliance strategies, tactics and tools needed in navigating a DCMA CPSR with special emphasis in public laws and evaluative documentation requirements, while also understanding the real time challenges companies are facing in today’s CPSR environment. At the conclusion of the presentation materials, the attendees will apply the lessons learned they have learned during the course to several case studies followed by discussions of those case studies. Government contractors subject to an Allowable Cost and Payment contract clause must submit an adequate incurred cost proposal together with supporting data for each fiscal year within six months after the end of those fiscal years. To establish final indirect rates and direct contract costs consistent with these important procurement provisions, contractors must understand all components of an adequate incurred cost proposal and the costs that must be included within these submissions. This course focuses on what contractors must know about the Incurred Cost Submission, ICS, including analysis of ICS Model Schedules, Contract Costs, and Rate Structures. Our expert instructors will walk you through a step-by-step guide to the preparation and filing of the Incurred Cost Submission (ICS) for Government contractors. This workshop is designed to show contractors how to identify and capture all allowable costs that may be claimed for reimbursement in the prescribed format consistent with FAR Part 42 requirements, and mitigate the risk of audit problems and issues. The instructors will provide a detailed, step by step guide to the preparation and development of the Incurred Cost Submission ICS. It begins with an explanation of accounting requirements such as the rules for allowability and allocability required to facilitate the successful completion of an ICS. The workshop also analyzes the different types of indirect rate structures used by contractors and delineates how companies should develop and present indirect rate structures and claimed costs as a part of these submissions. Through the use of a case study and exercise, workshop attendees will prepare and develop a company ICS. Students will learn critical data points, supporting documentation, and how to reduce audit risks when these submissions are reviewed. In addition, the workshop will cover the Incurred Cost Electronic model ICE, the electronic version of the model incurred cost proposal, and learn how it should be filed. Whether you have been doing business with the Federal Government for many years or have just won your first contract award, you will be provided with the skills and tools that will help to ensure that your submission is accurate, adequate, and complete. This course provides an in-depth look at the FAR and DFARS requirements for implementing and maintaining an adequate estimating system, preparing acceptable forward pricing proposals, and methods and procedures for assessing and minimizing the risk/vulnerability of adverse defective pricing findings from Truth in Negotiations Act violations. The primary focus of this course is on implementing and maintaining an adequate estimating system to take a proactive posture to defective pricing prevention. It is recommended for financial and manufacturing personnel who provide input to or rely on output from the estimating process for proposal preparation, and those individuals who are responsible for conducting internal estimating system compliance reviews. Strategies for avoiding or minimizing the effect of adverse audit findings. Price and cost realism analyses are evaluation processes to determine price validity and the most realistic price that the Government will pay for goods and services. This workshop features an in-depth explanation of how price and cost analysis techniques apply and impact the preparation, pricing, and evaluation of contract cost proposals. Coverage will focus on the pinch points in the process – those areas of significant and continuing controversy. Participant involvement and questions will also drive the discussion. The increasing importance of price and cost challenges to contract awards and how to manage and minimize protest risks will also be covered. The workshop starts with definitions from the rules, regulations, case decisions, and available guidance. Price Analysis is the process of examining and evaluating a proposal price without evaluating its separate cost elements and proposed profit. Price Analysis should be used to verify that the overall price offered is fair and reasonable. Price Analysis shall be used when cost or pricing data are not required. A Price Reasonableness Analysis is intended to prevent the government from paying too much for contract work. The purpose of a Price Realism Analysis has been described as a verification that the offeror’s price is not overly optimistic and impractically low. A Price Realism Analysis examines the performance risk of proposals in a fixed-price contract procurement, with particular attention to the risk of low-priced proposals, and may include cost realism analysis. A Price Realism Analysis will be applied in order to measure the offeror’s understanding of the requirements and/or to assess the risk inherent in an offeror’s proposal. A Price Realism Analysis is intended to determine if the contractor is proposing a price so low that the performance of the contract will be at risk. Cost Realism Analysis is the process of independently reviewing and evaluating specific elements of each offeror’s proposed cost estimate to determine whether the estimated proposal cost elements are realistic for the work to be performed; reflect a clear understanding of the requirements; and are consistent with the unique methods of performance and materials described in the technical proposal. Cost Realism Analysis may also be used on competitive fixed-price incentive contracts or, in exceptional cases, on other competitive fixed-price type contracts when new requirements may not be fully understood by competing offerors, there are quality concerns, or past experience indicates that contractors proposed costs have resulted in quality or service shortfalls. Results of the analysis may be used in performance risk assessments and responsibility determinations. However, proposals shall be evaluated using the criteria in the solicitation, and the offered prices shall not be adjusted as a result of the analysis. Cost Realism Analysis shall be performed on cost-reimbursement contracts to determine the probable cost of performance for each offeror. Cost Reasonableness and Cost Realism are distinguishable, but both of these analytical frameworks critically examine the cost elements of a price proposal. Cost Analysis shall be used to evaluate the reasonableness of individual cost elements when cost or pricing data are required. Cost Analysis may also be used to evaluate information other than cost or pricing data to determine Cost Reasonableness or Cost Realism. The objective of Proposal Analysis is to ensure that the final agreed-to price is fair and reasonable. Questions are encouraged and the materials and resources provided will help participants to meet the new and continuing challenges in cost and price analysis in the new competitive environment of contracting. In 2009, the Commission on Wartime Contracting issued a special report on contractor business systems. This report highlights the Commission’s principal conclusion: “Contractor business systems and internal controls are the first line of defense against waste, fraud and abuse.” This report set in motion the promulgation of the Defense Federal Acquisition Regulation Supplement (DFARS) Business Systems Rule, which was finalized on February 24, 2012. This course focuses on the development of internal controls for compliance with the DFARS defined Business Systems: Accounting, Estimating, Material Management and Accounting System (MMAS), Earned Value Management (EVM), Purchasing, and Property. The course emphasizes the role of the Defense Contract Audit Agency (DCAA) in auditing and evaluating contractors’ internal controls. In fact, DCAA has continuously developed new audit programs for assessing contractors’ compliance with the detailed requirements of the DFARS. This has been an evolution that has resulted in shifting emphases by DCAA up to and including the present time. The Defense Contract Management Agency (DCMA) has similarly adjusted its review criteria as well. The instruction provides recommended and proven approaches to develop, maintain, and monitor internal business system controls for compliance with Government contract requirements including FAR and DFARS business system requirements. This course is recommended for those individuals who have a fundamental or better background in negotiated government contracting, and government contract regulatory compliance-related responsibilities. It will benefit individuals with responsibilities for developing and conducting internal compliance audits and oversight reviews as well as contractors who wish to establish, improve or update existing systems of internal controls. Overall, this course will enhance skills in government contract compliance risk management. The adequacy qualities, government oversight approaches and significant compliance issues related to various business systems.